Questioning Your US Expansion Plans: Is It Time to Upgrade Your Philosophy? Socrates became the world’s most famous philosopher, not by having all the answers, but by asking the right questions. “Question the Questions” is a new report that comes out of the realisation that many European companies could benefit by just asking better questions. 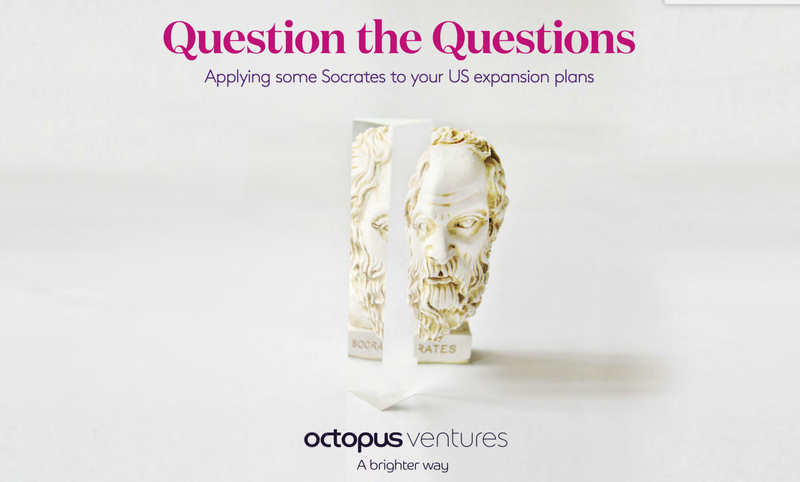 Questions the Questions is a new report from Octopus Ventures that provides a stress-tested guide to international expansion, powered by insights from over 100 European VC-backed businesses that expanded to the US. It tracks the growth of start-up clusters across America and combines data analysis with practical advice for start-ups looking to expand their offering to the US. Many European start-ups see US expansion as a logical next step to build on their home market success, but in many cases a US operation can be a painful return to square one. Founders benefit from rejecting all assumptions when entering the US market, which means questioning and testing their expectations of a country that seems culturally familiar, but is in many ways a world apart. As this report makes clear, there isn’t one single recipe for success, but in asking the right questions a company can clarify their US expansion ambition. Without a well-developed, strategic rationale for international expansion, companies risk under-resourcing their foreign entry, under-committing executive time and focus, and struggling to scale operations abroad. Stress-testing your expansion rationale can help ensure your team and Board are fully committed to the success of your international expansion. Case studies and practical tools will help you apply the questions that will reveal the clearest trajectory for your own expansion plans. How much do you like flying? Before you open your doors to customers in the US, you should research the market in person.There is no substitute for physical presence. Your competition in the US is likely to include American startups and established American companies, groups who live and breathe the US market and culture. The reality is that many European companies tend to be less prepared for US entry than their American counterparts. Do you have a compelling offer for American customers? Can the industry name your brand? Do you have product-market fit? Do you have two to five reference customers? Do you have a replicable sales strategy? The consensus on one issue is clear: CEO and/or Founder DNA is a necessary — if not sufficient — condition for success in the US. The absence of key executives on the ground can signal that the US is secondary and raises questions about the company’s commitment to the market long-term. Another common mistake is to assume the culture you’ve built will transition to the new US office seamlessly. Even with a leader on the ground there will be challenges, as local practices and the lack of corporate memory of the new office influence the behaviours of the new members of the team. Who is on your US advisory board? How do you protect your IP? Where will your office be? What taxes will you be liable for? How will you build your US team? How do you fundraise in the US? And don’t forget, being the US lead is a huge challenge, so rely on support from HQ and give yourself a pat on the back from time-to-time. Any plans you may have, or may be dreaming of, will emerge from Question the Questions with renewed, pristine clarity. Expanding to the US need no longer be an unexamined “irrational inevitability”. Location, taxes, remuneration, culture, fundraising, baseline metrics, visas, conferences and the small but important areas you might not have thought of (a friend with a house in the Hamptons? ), create a guide that will both challenge and strengthen your planning process, whatever its current form. Thank you to all the CEOs, executives and operational experts interviewed for your frankness and insights — you know who you are. Your hard-won lessons will help the next generation of European companies to make their mark in America. If you’re a CEO or founder of a European venture-backed business that has raised more than $5M and are currently living and working in the US, consider joining this email group . You will be in be in great company. Want some help asking the right questions to help your business to succeed? Get in touch with our experienced team at Octopus Ventures. One of @OctopusVentures team seeking unusually talented entrepreneurs. Based in NYC. Latina, mother, tea-lover. Practical support and insights from the team at Octopus Ventures, a multi-stage London VC backing unusual talent intent on global impact.